SANTA CLARA — The Packers held a 7-0 lead after one quarter of play at Levi’s Stadium, the result of a 12-play, 80-yard drive on the opening possession of the game. San Francisco won the toss and elected to defer their choice. The Packers’ first play of the game was a bomb for James Jones. The ball glanced off his hands. A third-down sack was nullified by illegal contact, and the Packers had a first down at their 24-yard line. A third-and-2 conversion followed when Aaron Rodgers found Randall Cobb at the Packers 42. Out of the no-huddle, James Starks rushed for a first down at the 49ers 47. 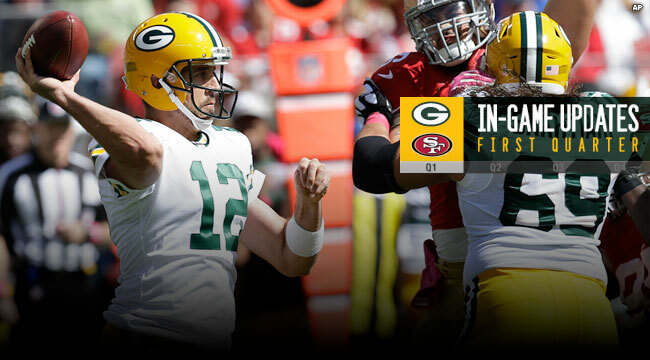 Rodgers passed to Richard Rodgers at the 49ers 35, and the Packers were in scoring territory. Rodgers followed with a 19-yard pass to Cobb at the 11. Two plays later, Rodgers threw to Richard Rodgers for a touchdown with 9:02 to play in the first quarter, 7-0. The 49ers opened with a Colin Kaepernick scramble for 12 yards, but the drive quickly stalled, the 49ers punted and the Packers took possession at their 15. Ty Montgomery lined up as a running back and rushed for 9 yards. Rodgers then scrambled for 12 to the Packers 36, but the drive stalled. The quarter ended with the Packers in possession of the football at midfield.